Wowsers. Svetlana Kuznetsova snapped Serena Williams’s 20-match winning streak in Miami, coming from a set down to win, 6-7(3) 6-1 6-2. Let’s start with Sveta… what a performance! The two-time Slam champ finished with remarkable stats of 27 winners to just 13 unforced errors. Kuznetsova can be so vulnerable early on in a tournament but if she can get through her first few rounds, she has this incredible ability of clicking in the latter stages. Madrid: Barely beats Mugu/Stosur/Lucie. Routs Maria 6-2 6-4. And Serena… there are so many hot takes right now. I’m struggling to comprehend the scoreline and how it turned after Serena had played a decent first set. The world number one played some characteristically clutch tennis with her back against the wall (*3-3 *0-40) and serving well when she needed to. There were some stunning rallies in the first set (see tweet below). Kuznetsova grew stronger as the match wore on with Serena becoming increasingly error-strewn as her movement stuttered. Kuznetsova’s defence is up there with the best of them and she kept the ball low with her slice which unsettled Serena. I love it when we all look forward to something and it delivers. In their first ever match-up, Azarenka defeated Muguruza, 7-6(6) 7-6(3)… and that’s a match-up I want to see again… SOON. There were so many positives to take away from this match. The first set was magnificent, probably the highest quality set of women’s tennis so far this year. I’m still speechless at some of the forehand winners that Muguruza produced towards the end of it. And despite peak Muguruza making an appearance after a sluggish start, it was still Azarenka who toughed out the set, saving two set points in the tiebreak. The second of those saves was on a daring return that found the line. Peak Azarenka made an appearance at the start of the second set as she produced back-to-back return winners to get the all-important break at the start of the second set. The highest-quality set I've seen this year. The kind of set you hate that someone has to lose – and the unfortunate loser is Muguruza. 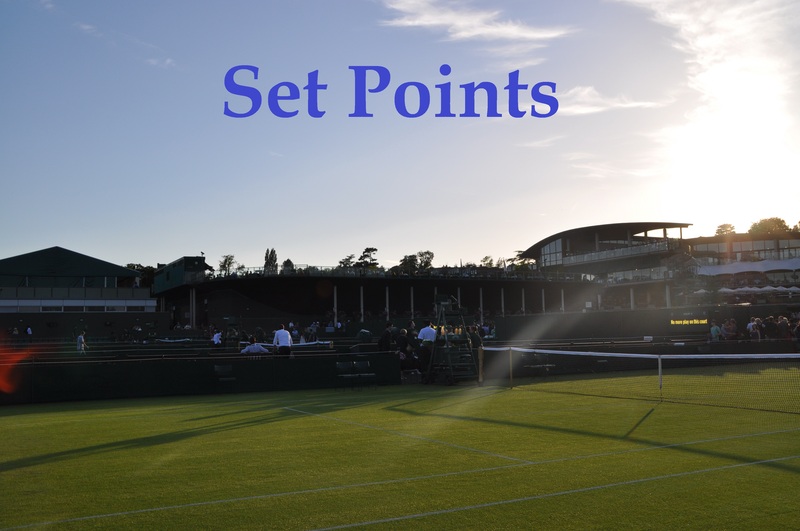 There would be another twist though as Azarenka served for the match at *5-3; the game swayed between break points and match points with Muguruza producing two winners (a volley and an overhead) down two match points before a LUCKY netcord went the Spaniard’s way on break point. The netcord knew we wanted more of this fabulous match. Azarenka looked a little rattled as Muguruza held with scoreboard pressure at *4-5 and *5-6 to force another tiebreak. A double fault from Muguruza at 1-1 in the tiebreak set the tone though as Azarenka, rather comfortably, sealed a straight sets win. Great match, ladies! Radwanska never really recovered after that with Bacsinszky edging a break-heavy second set, 6-4. The Swiss player began to dictate more and more of the rallies and, bolstered by a 81% first serve percentage in the third set, came through to reach her first quarter-final of 2016… well done, Timea! Bacsinszky plays Simona Halep in the quarter-finals who defeated Heather Watson, 6-3 6-4. The world number five battled back from 1-3 down in the first set. Watson showed some encouraging signs and took some risks, but the rising error count was her undoing. In all this MADNESS, Johanna Konta continues to notch up impressive wins. The Brit is into her first quarter-final at a Premier Mandatory tournament after she defeated Monica Niculescu, 6-2 6-2. There were some interesting stats, notably the first serve % and net points won for Konta. The Brit plays Azarenka in the quarter-finals which could be a great tussle between two in-form players. After being a set and a break down to Lesia Tsurenko in her first match of the week, Ekaterina Makarova has summoned some of her best form to beat Tsurenko in three, and back it up with straight set wins over Petra Kvitova and Elina Svitolina. Makarova beat Svitolina on Monday, 6-1 6-4, for her fourth consecutive straight sets win against the Ukrainian. Makarova plays Kuznetsova in Tuesday’s late-night quarter-final. I’m pumped for the last of the quarter-finals which will be contested between Angelique Kerber and Madison Keys; Keys recorded her third consecutive straight sets win in Miami, defeating Irina-Camelia Begu, 6-3 6-1, while Kerber overcame Timea Babos in three sets, 6-2 3-6 6-4. The Australian Open champion produced an incredible forehand pass on match point. The last two matches that Kerber and Keys have played were the finals of Eastbourne and Charleston, which both ended with a 7-5 third set scoreline… should be a fun one! Kerber-Keys. Hope they bring it like they did in the Charleston final bc that was life-affirming. Moving to the doubles, Margarita Gasparyan and Monica Niculescu produced a huge shock, defeating the number one pair of Sania Mirza and Martina Hingis, 6-4 6-2. The last of the pictures in the tweet below is EVERYTHING. March 29, 2016 in Miami, Set Points, WTA. I do not know what the problem was with Serena,her footwork,which has always been excellent,was slow and her serve at times in this match let her down,she goes onto to clay season without winning a title! The match I loved so far at Miami,also one of my fav matches this year,Garbine v Vika,.Vika continues to impress,after her win at IW. Svetlana is the second most gifted player on the WTA. Talent has never been her issue, its just she lacks the hunger that Serena, Henin, Sharapova etc have. Much like Venus. If she wanted it as bad as they did she’d probably have a dozen slams. Svetlana said winning that first slam that early, basically destroyed her mentally with the pressures it brought. It’s like she had to rebuild herself, something you see with other players too who are overawed by that first slam win. Those players you mentioned are true mental champions and they can win inspite of/not just because of their physical talent. Probably innate. With Serena, I think it’s less doubt but more like you said, waning hunger for the day to day game play, although, the record is still enticing. But mind you, that loss to Vinci has also coloured her view. In that sense, I feel she doesn’t come to her matches with a to win at all cost attitude, hence her intenisty at the start of matches too. As far back, as 2014, I kind of felt she would be retiring 2016-2017 ish. There is so much mind over matter an aging body can take as well. That said if she makes all four Slam finals, it is within reason that one is going to give so we’ll see. Ha, had Australia been Maria, or even IW, you know the story would be different. Kerber, Azarenka, Svetlana these are ‘friends’ so she has to dig deeper to find the ‘kill’ switch when the going gets rough. Maybe the trick is to now write all these girls as ‘enemies’ in her diary, then we’ll be good to go for a last grand hurrah ?! ?